Win*Star 6.0 Professional System has all of the features of the Standard and the Extended versions but, in addition, also has complete versions of Matrix Search, Matrix Horizons, and Day Watch. This system is designed for serious counseling Professional Astrologers—those who will be able to understand and harness the power of astrology available in this complete software system. Search Interpreter, which provides: 30 Years Saturn Transit Report, Yearly Stations report, Monthly Tra-Prog (Two Chart), Yearly Tra-Prog (Two Chart), Life Scans, Decades - Tra & Prog, . . . and More. Ability to add any planet, object, or point in the universe. View your searches as a scan. Sort, sift, and filter your results. One-Click Pre-set sorts include: Time; Planet Pairs; Planets, Time; Aspects; Events; Search Types; Enter, Exact, Leaving; Exact, Enter, Leaving; Planet 1's position; Planet 2's position. One-Click instant views include Lunations, Eclipses, Lunar Phases, Void of Course Moon, Stations, Sign Ingresses, House Ingresses, Equinoxes and Solstices, Synodic Cycles, Aspect, Aspect Combinations, Chart Patterns, Moon Apogees and Perigees, Lunar Days. Outputs in convenient PDF format, easy to save, print, and e-mail. An Edit Aspect Patterns window.
. . . 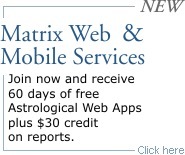 Check the "Matrix Search" page for more info. Hi-resolution maps, ideal for quality printing. Extensive reports, including: Planet line interpretations, Relationship, Composite, CycloCartoGraphy, Transits, etc. Total flexibility in regards to the choice of what to display and how to display it. A mouse click relocates natal wheel, composite, transit, CycloCartoGraphy, or Local Space. Quickly add or delete cities. City Scoring: this is an innovative and simple way to evaluate any city or cities you select.
. . . Check the "Matrix Horizons" page for more info. Print a particular month, several months, or an entire year—with or without interpretive text. The auto e-mail feature allows you to send calendars directly from the program to your client. Display traditional holidays, or, define your own holidays.
. . . Check the "Day Watch" page for more info. Available Hard-Drive space 650 Mb free.